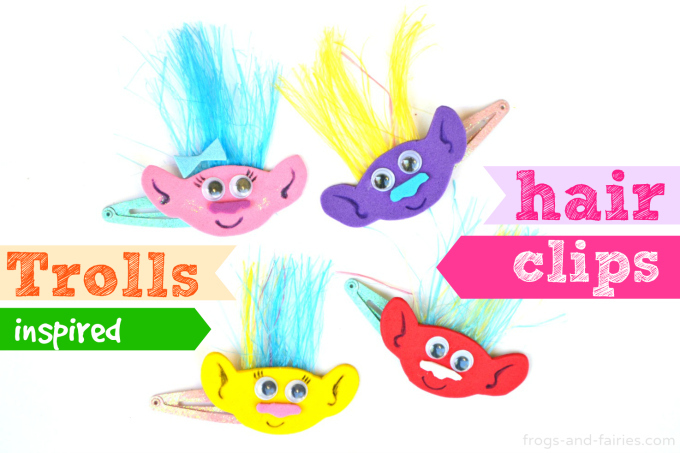 Does your little one love Trolls? 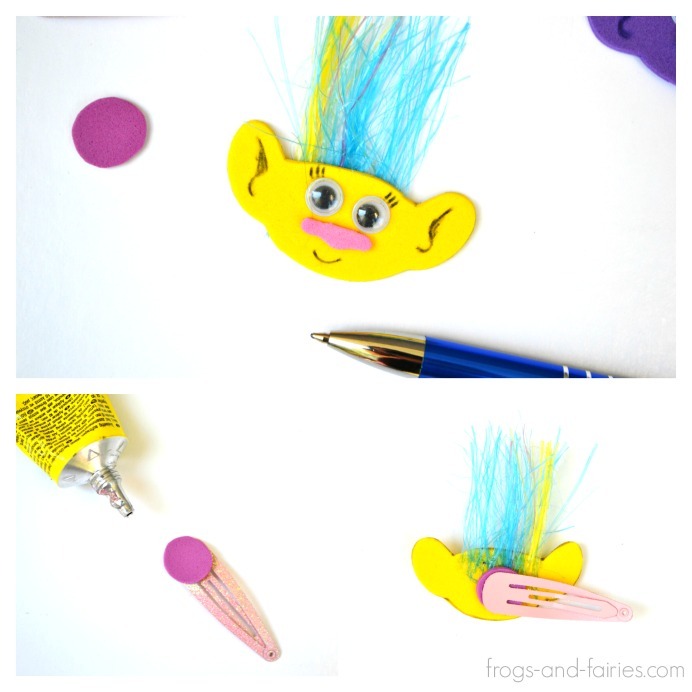 Check out this simple tutorial and transform plain classic hair clips into FUN and colorful Trolls hair clips, inspired by the Trolls movie! 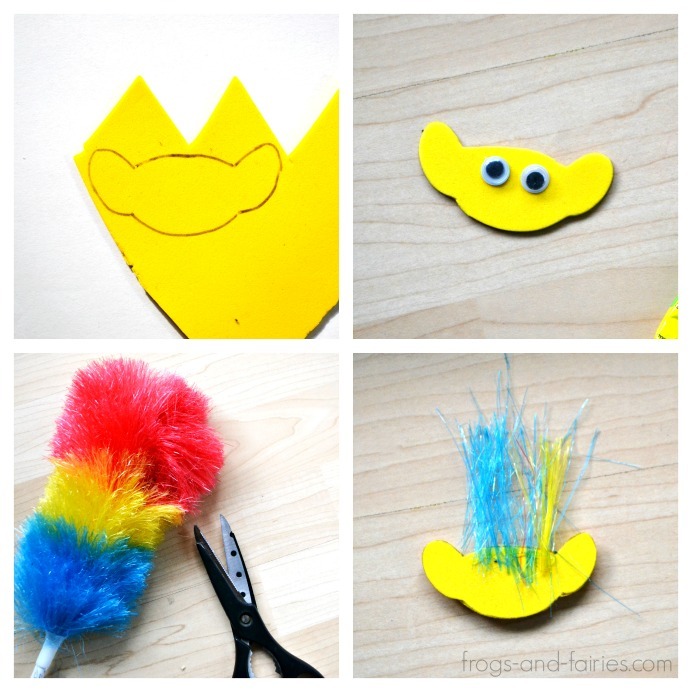 First, sketch a shape of a troll’s head on a craft foam sheet and cut it out with scissors. You can make a simple template beforehand by sketching the shape on a piece of paper first, cut it and then trace the template onto the craft foam. Whichever is easier for you. 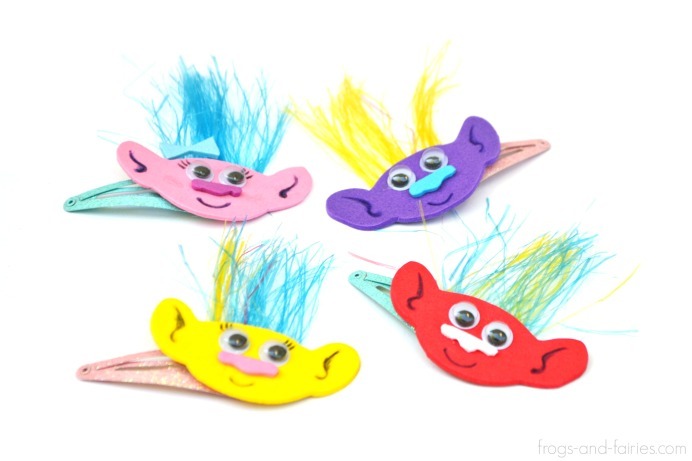 Now find something that’ll represent trolls hair. It could be colorful soft broom bristles, wool or even craft supplies like colorful feathers, tulle or fuzzy faux fur. Get creative! 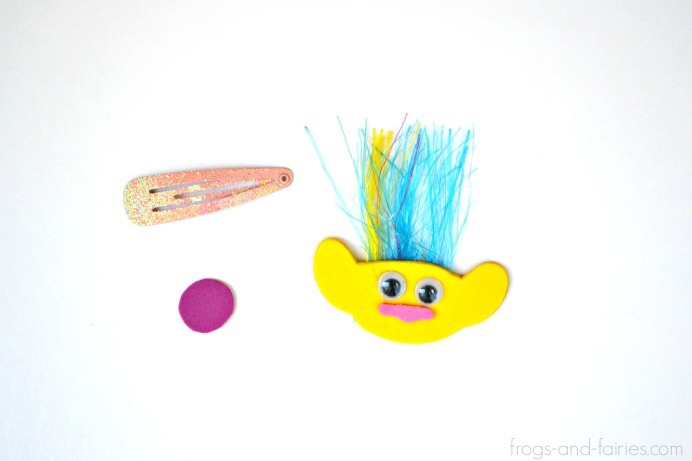 We used an old, clean dust broom and cut some colorful bristles, that we then glued on the back side of a troll’s head! After the clue dried completely, we cut the hair with scissors to even it out on top a little. Attach two googly eyes with liquid glue and also add a nose, which you cut out of craft foam sheet. 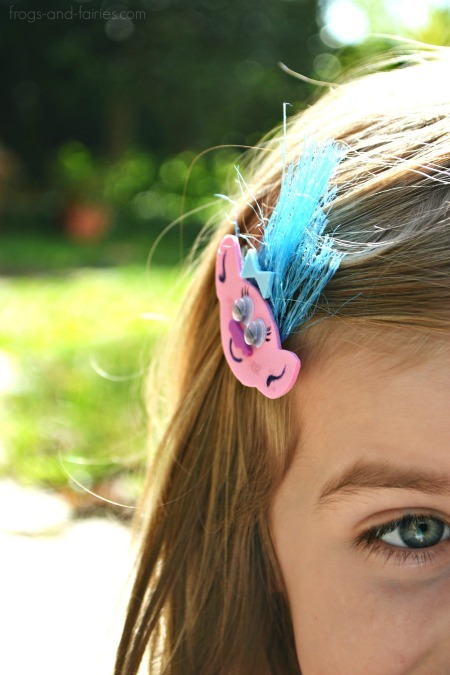 Cut a small circle out of craft foam and glue it on the regular hair clip. 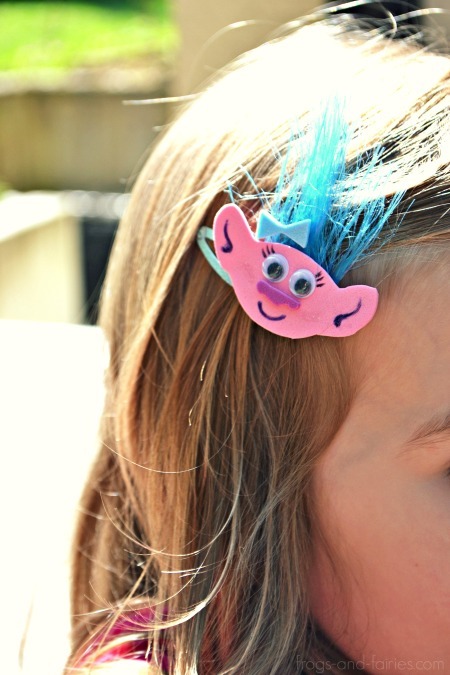 This will make you trolls hair clips more flexible and easier to manage. When the glue dries, you or your little one can start wearing it! My daughter thinks they’re super cute! We had so much fun with this project, that we ended up making a lot of them! Each of them unique and so fun! I hope you’ll love this project too! Enjoy! SAFETY NOTICE: These hair clips are not suitable for babies or small children, due to small parts (chocking hazard). If you haven’t already, don’t forget to check out these two more Trolls inspired projects! Click HERE for fun masks and hair headbands tutorial with FREE printable and HERE to make some adorable clay pods! 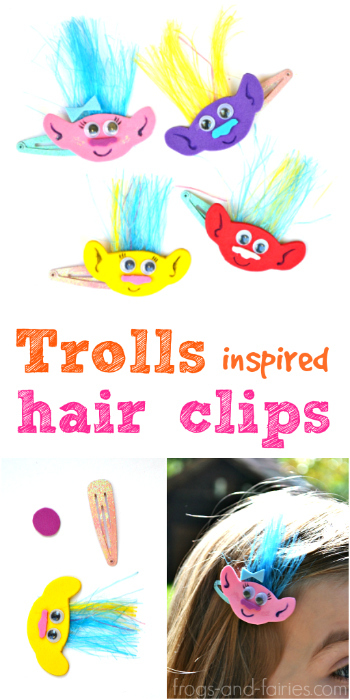 I absolutely love these troll clips and I know my daughter is going to go crazy for them. What a great project to do with my girl. I have to be honest here I also loved the Trolls movie, it certainly has to be one of the best kids animated movies that I have ever seen! Thank you Lynne! I’m glad you like these hair clips! The movie really is fun. It’s one of our favourite movies too!